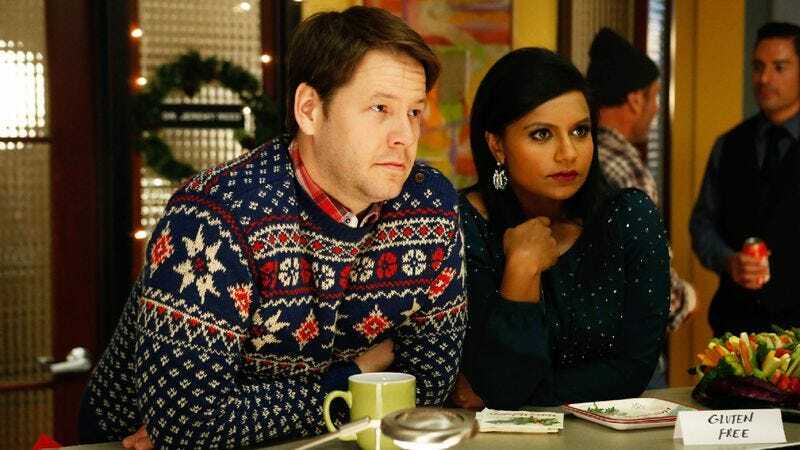 Will The Mindy Project’s second Christmas be its last? Here’s what’s up in the world of TV for Tuesday, December 3. All times are Eastern. The Mindy Project (Fox, 9:30 p.m.): The holidays are rough on everyone, but The Mindy Project has a particular case of Yuletide blues: It was around this time last year that retooling paved the path for Amanda Setton’s deliverance unto The Crazy Ones. This year’s Christmas episode, meanwhile, begins the countdown to the show’s impending hiatus—so get in your glad tidings for Dr. Lahiri while you can. Gwen Ihnat recommends getting the cast some gift cards, because they can spend those wherever they may end up next. Brooklyn Nine-Nine (Fox, 8:30 p.m.): A late Thanksgiving means your favorite TV characters are whiplashing their way from one holiday to the next this week. In the 99th precinct, Christmas is all about Jake protecting Holt after the latter receives death threats—a classically buddy-cop premise which Molly Eichel counts as a Christmas miracle! Supernatural (The CW, 9 p.m.): A “massive amount” of angels are mowed down in the inevitable angel war. But what counts as a massive amount when it comes to angels? One thousand? One million? Eric Thurm crunches the numbers. Black Mirror (DirecTV, 9 p.m.): The second season begins with the tale of a lost loved kept alive via social networking. When it’s David Sims’ time to go, he hopes to be resurrected in a series of humorous GIFs. Trophy Wife (ABC, 9:30 p.m.): After several painful, BERT!-free weeks, Trophy Wife reunites a TV audience with its sole, pint-sized reason for living: BERT! Tears of joy stream down Brandon Nowalk’s face. Sons Of Anarchy (FX, 10 p.m.): SONS OF ANARCHY DVR ALERT: After a week away, the SOA DVR Alert returns to remind you that tonight’s episode is 90 minutes long. Zack Handlen reminds you to stay vigilant—extra Sons Of Anarchy could happen at any time. Awkward. (MTV, 10:30 p.m.): The title of tonight’s episode promises the return of “Old Jenna,” and Myles McNutt hopes we can all block the past few weed-smoke-choked weeks behind us. New Girl (Fox, 9 p.m.): While its Tuesday-night companions celebrate the season, New Girl flashes back to September, going “All In” on a repeat of Winston’s struggle with his eternal nemesis: puzzles. He’s not very good at them, and Erik Adams is still laughing about it. What Would You Do? (ABC, 10 p.m.): ABC boldly ushers a Nickelodeon classic into the 21st century: the pie-flinging, foam-spraying game show that successfully replicated the super sloppy success of Double Dare by doubling the mess, upping the dares, and more or less being Beat The Clock For Kids. Or maybe this is just the latest premiere of the hidden-camera Primetime spin-off that challenges everyday heroes to step up in uncomfortable situations. Uncomfortable situations that never involve a Pie Coaster, sadly. Secret State (DirecTV, 10 p.m.): The second TV adaptation of A Very British Coup closes its very American run. Zack Handlen looks forward to a future TV adaptation of Starbucks’ Very Berry Hibiscus Refresher. The Legend Of Shelby The Swamp Man (History, 10 p.m.): Break out the swamp tinsel and pour yourself a mug of egg muck: It’s “A Very Shelby Christmas,” confirming there’s still some elasticity in the “A Very [Noun] Christmas” construction. NHL Hockey: Stars at Blackhawks (NBC Sports, 8 p.m.): The Stars wander helplessly into the maw of the Windy City beast, facing a Blackhawks squad that has only lost four games in regulation this season—and only one game in Chicago. Almost Human: An off-brand RoboCop gets a generic Nuke all its own. But will the drugs of Almost Human’s future make “Made in America” mean something again? Kevin McFarland just hopes for a prophet as creepily charismatic as Tom Noonan.